AND a special out door sewing Sunday School with Glenn from Bags For the People!! Yes! There will be sewing machines outside and we will learn from the master how to make our own reusable totes. These are easy and fast to make, even for a beginner. We will be part of a great outdoor party with lots to do and see. Come spend some time with us, get something to eat in the picnic block, and in general see some of the best people watching of the summer. 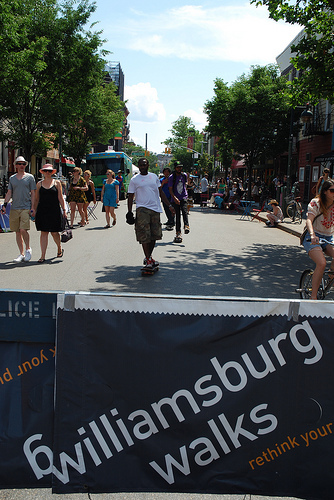 The Williamsburg Walks are going on all weekend, so come for the day! More info about Williamsburg Walks is here. Of course, you are welcome as always to bring your own current craft project, your friends, loved-ones, kids, snacks to share, anything and everything that inspires you to flex your creative muscles. Don’t forget your sunscreen, sunbonnet, or parasol. You may also want a sit-uppon if you aren’t sewing under the tent. **And make a note: our regularly scheduled craft-on July 4th will be canceled for the holiday! This entry was written by tvecallie, posted on June 22, 2010 at 2:18 pm, filed under Events, New York and tagged brooklyn, craft, craft on, creative reuse, DIY, Event, free, friends, meetings, New York, party, people, picnic, sewing, skillshare, spacecraft, Sunday School, Williamsburg Walks. Bookmark the permalink. Follow any comments here with the RSS feed for this post. Post a comment or leave a trackback: Trackback URL.